This is the closest I will ever come to jumping into the Head of the Lake. 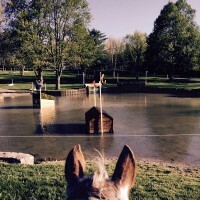 There are two ways to get to ride around the Rolex Kentucky CCI**** course. There’s the hard way, where you become an extraordinary horseman by putting your blood, sweat and tears into learning the sport for a decade or three, then carefully find, train and manage an amazing horse. Then there’s the easy way, when you get extremely lucky and take advantage of an opportunity from the title sponsor of the competition to check out the track on horseback alongside Leslie Law, someone who’s done it a few times before. I have a better chance of getting struck by lightning than getting a horse to jump into the Head of the Lake, even if I were brave enough to try, so needless to say I took the latter option. Rolex kindly sponsored a guided trail ride around the four-star course for a handful of journalists, and I dutifully polished my paddock boots and added clean breeches to my suitcase before I left for Kentucky. Nevermind that Leslie wore sneakers and jeans, he’s got an Olympic gold medal, he can go in a swimsuit if he’d like. I’ll never get another chance to be on horseback on a four-star track, and I wasn’t about to go in muddy boots. I knew most of the journalists and had met Leslie in press rooms and in-gates, but it’s always more fun to bond in the saddle. We were all well-mounted on reliable trail horses from the Kentucky Horse Park with appropriately western names like Comanche and Pocahontas, and they probably could have taken us around the track bridleless. Leslie offered plenty of insight around the course (once he sorted out his reins—first thing he told us was that he didn’t know how to steer his horse). He pointed out, for example, that the skinny brushes in the Head of the Lake this year (13BC) were similar to those at the Ocala CCI** (Fla.) earlier this year, which caused plenty of questions even at that level. Sure enough, we did see 10 or so combinations trip up there. And I found his description of the question at the key hole and corner combination at the Mounds (16AB) really helpful in understanding why riders would choose to ride the track in three or four strides. He explained which tests were more for the rider, and which for the horse. We spent a long time checking out the frangible technology, which Francis Whittington demonstrated perfectly when Easy Target demolished the corner coming out of the Land Rover Hollow. Leslie was generous and funny with his insights and thoughts, but my favorite moment came when Phillip Dutton and Boyd Martin had to stop walking the course to let us pass and even smiled at us. No offense to my fellow journalists, but I don’t think that we impressed them at all with our riding skills. At the end of our ride I asked Leslie if he enjoyed his western saddle, and he demurred for a moment before saying he probably wouldn’t run out to get one. But that’s OK. When you have an individual Olympic gold medal you can plan on riding around Rolex another time in English tack. The rest of us were just thrilled to be out there at all. Check out all the Chronicle’s coverage from Rolex Kentucky CCI****. For a full report from Rolex Kentucky CCI****, check out the May 11 issue of The Chronicle of the Horse. Also follow along with the Chronicle on social media on Twitter, Facebook and Instagram.